I’m in a mood to give my house a new look. We moved into our 1100 square foot circa 1971 home four years ago with a lot of plans to spice it up, and well, there’s a lot we still have not done. A lot of it has to do with time and money, but paint doesn’t cost that much and I know it can dramatically change the appearance of a home. We originally wanted to sell the house and buy a bigger one by now, but with the job situations and the fact that we currently owe more on the house than it would sell for we are stuck here for a little while longer. I figure if we can’t move, I might as well be happy with what I see every day. Our house is white. I think there’s a mixture of wood and aluminum siding on the house. The front of the house is in desperate need of a face-lift. I’m planning to repaint the entire front of the house white. The other sides of the house are in decent shape, they just need a good cleaning with a pressure washer. The windows have a black frame, the front porch light and house numbers are black, and our roof is a dark charcoal color. So, right now we just have a plain, old black and white house! There is one major eyesore on the front of our house. It drives me CRAZY! The previous owners converted the one car garage to an extra bedroom and they did a shoddy job of closing in the exterior garage door “hole” or whatever you call it. It’s recessed, the window does not fit properly and the siding they put up does not match at all. I hate it. I’ve tried to convince Mr. Simple to build it out for me and make it match the rest of the house. I mean, he used to be a carpenter. One of these days, hopefully, he will finally fix it for me! I know it’ll be a big job, but it’s just so ugly the way it is now! Back to the topic, though. I want to paint our front door red. I love the look of a red front door on a crisp, white house. 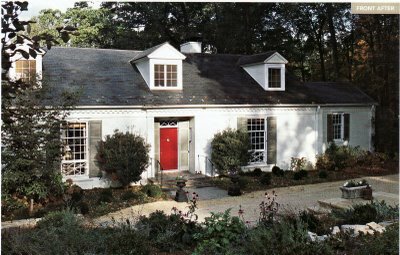 I want to freshen up the front of the house and paint my door red. We do have an ugly black screen door that will have to go to highlight my front door, but I think it will make the house so much warmer and inviting. I want a home that people feel welcomed. I’d like to add a planter and a glider to the front porch and a windowbox to the window that is in that ugly garage door “hole.” I’ve got plans to spice up my house with paint. Maybe I’ll share some pictures as we start the transformation!